On the one hand: it's not a dual/stereo delay anymore. On the other: it's smaller, actually available (for preorder), and cheaper. And it has Euro-level 1/8" jacks as well as standard 1/4" jacks. I was thinking about picking up a used Shallow Water, but now I can't decide whether to get this first. And it has Euro-level 1/8" jacks as well as standard 1/4" jacks. Smart move. This is something seriously missed in a good many pedals - jacks and levels for Euro. i have a shallow water, but from the sounds of the demos i felt the cimmerian caves was different enough to warrant plunking down the $$$ to try one out. it'll then be a 3-way shootout between those two and the Zvex ILFJ module. but the LPG on the shallow water does some really cool things. i'll post back with my impressions once this shows up. Man, I wanted the original so bad. This is tempting. These are finally shipping, after a few delays. Got mine and played with it briefly. The 3.5mm inputs aren't Euro level -- maybe line level. It still takes some attenuation not to overdrive it. It overdrives nicely though, if that's what you want to do with it. The delay goes to about 1150ms, is quite dirty above about half of that but not as glitchy and crackly as some PT delays. I actually kind of wish it was dirtier at shorter delay settings too, because this is where some of the character of the pedal shines. It's quite dark and dubby overall, and the feedback gets a bit skronky and weird at high settings without screaming. The fuzz does what it says on the tin -- maybe a guitarist would be a better judge, but to me it, and the drive I get when I back the attenuation off, mean I can pull the Rat clone off my pedalboard for when I want that. As an effect, though, I'd rather have had it inside the delay feedback loop. I suppose I can always patch that though! I expect the previous version, with dual delays, was more exciting overall. But it must have been pretty huge; this smaller version is still my biggest pedal by far. 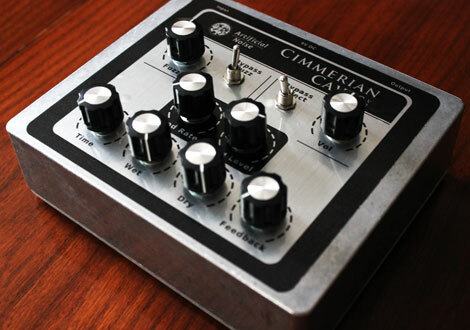 I'm selling a Cimmerian Caves V1 on Reverb, contact me for offers. Best of luck to those with the V2 The V1 was something special.